I wasn’t originally going to write this up but seeing as though I won’t have much time free in a few weeks I thought I might as well. So, this game would hang at the Q Sound check at startup. After a quick check I found why. I straightened the pin and the game now works. Hahaha, fantastic. Even I could just about fix that one! Did you replace the pin, or had luck bending it back? 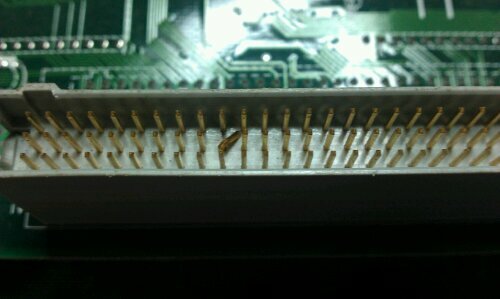 I’ve got a broken pin on a Mega System 32 that needs replaced, haven’t got around to it yet. I took a fair bit of time in bending it back. It’s very weak now so I must take care with it in future. I have some thoughts on pin replacement but not tried it yet.